LAS VEGAS — There's nothing like a puppy to brighten someone's day. And while a new furry best friend is a popular holiday gift, there's a word of caution about the hidden risk of getting a puppy from a pet store. Questions are being raised after the Humane Society released undercover video they shot at the Petland store near Summerlin, Nevada. The Humane Society had members of their organization get jobs there and at a store in Kennesaw, Georgia to document conditions they've been trying to expose for years. The video was shot in November at Petland in the Boca Park shopping center. The Humane Society claims the store is just waiting for the Maltese puppy in the video to die, and that people need to know the truth about those doggies in the window. "Since 2006, we received over 1,200 complaints from consumers who have purchased sick and sometimes dying puppies from Petland," says Humane Society Western Region Director Heather Carpenter. The animal welfare organization offers this video as proof that there's a problem when pets are sold for profit. But Boca Park Petland store owner Jeff Fausett says not so fast. "My reaction is it's a total fabrication of the events," Fausett says. He says the Humane Society is trying to make it look like Petland was warehousing a dog until it died. "That's never happened here. That's not what we're about," he says. There are a few simple facts he wants to make clear. "This was not a dog that, one, was in our kennel for weeks," Fausett says. "It was at the vet for weeks. It had a birth defect and it went back. It wasn't going to die." According to Fausett, after Petland sent the puppy out for medical care due to a respiratory infection, the veterinarian discovered the dog's air passage was too narrow. Fausett says he would never sell a puppy with that condition and surgery would cost several thousand dollars. So he sent the dog back to the breeder. "He re-homes those dogs when he gets them. He doesn't destroy them," Fausett explains. "So whether we re-home it or he re-homes, it is academic." Click here for statement provided by the Boca Park Petland store. So what about the thousands of other complaints the Humane Society points to at Petland locations across the country?
" We sell 1,600 puppies a year," Fausett says. "And very few of those — maybe 1 or 2 percent — have illnesses and have mortality, which is even lower than that." Las Vegas Animal Control investigated the Maltese puppy on November 19. Their report states "no violations observed regarding failure to provide medical" attention but Las Vegas Metro Police say their animal cruelty unit does have an open investigation regarding that puppy. 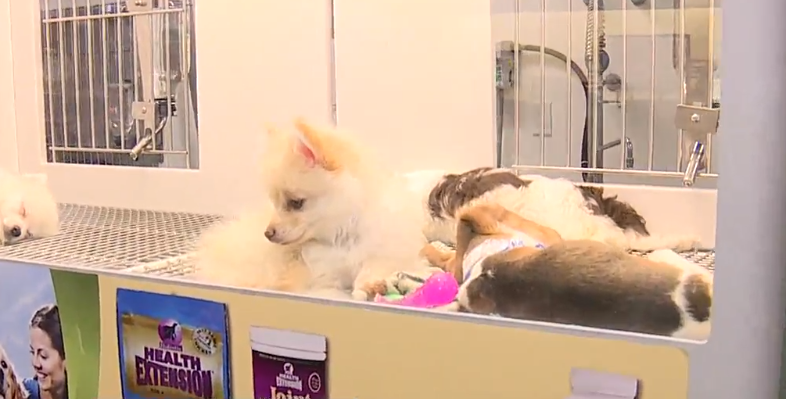 Veterinary experts say far too many pet store puppies get sick because they often come from puppy mills, large commercial breeders concentrated in the midwest that are infamous for inhumane conditions. Industry medical professionals say illness spreads when puppies are transported from the breeders. And even if a vet clears a dog when it arrives, many conditions are still incubating so symptoms may not show up for days or even weeks. "If they can't find their new best friend at the shelter or with one of the rescue groups ... do their research to find a responsible breeder," Carpenter says. "And part of that would be knowing where the puppy came from, where it was born and raised." For any dog or cat purchased from a pet store, before the sale is complete, Nevada law requires the store to disclose the name and address of the breeder and any other dealer who may be involved. Click here for more information. Read the Humane Society's full report below.